Synopsis: In Pittsburgh, accomplished pathologist Dr. Bennet Omalu uncovers the truth about brain damage in football players who suffer repeated concussions in the course of normal play. Review: In recent years, I haven’t been the biggest Will Smith fan. Not that he’s given us any reason to be. A series of high-profile pseudo vanity projects have trampled the one-time surefire blockbuster maker into questionable territory, with audiences not totally trusting the former Fresh Prince of Bel-Air. Honestly, I’ve never totally warmed to Smith’s onscreen presence, too often feeling like the actor was showboating more than acting. Even his Oscar nominated turns in Ali and The Pursuit of Happyness felt like Smith barely tapping into the maximum of his potential. So I approached his latest drama with some caution because the melodramatic trailers had the whiff of a desperate attempt redemption. Well, there’s redemption to be had in Concussion but it’s not the least bit desperate or undeserved. As a brilliant pathologist that finds a link between football players and traumatic brain injuries, Smith (Winter’s Tale) turns in his best performance to date. He dives deep into the character, eschewing his penchant for winking compliance in the face of adversity for a more realistic take on a man that knows a dangerous truth and can’t understand why others don’t know it too. 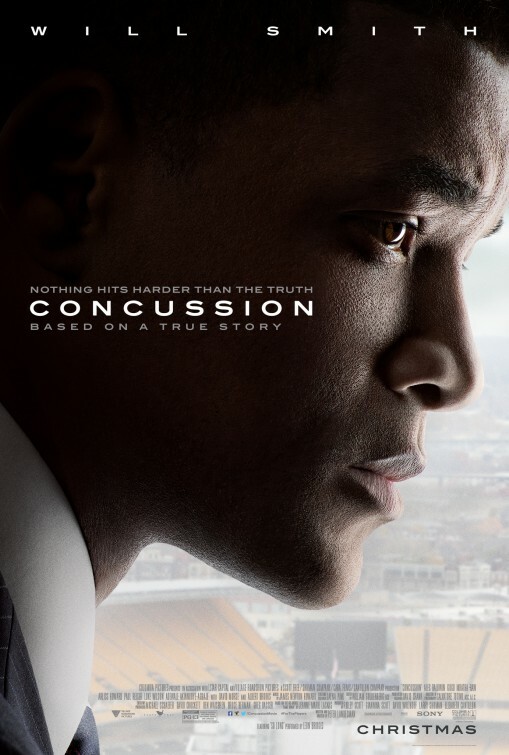 I’d imagine that the timing of Concussion was not only considered for Smith’s chance at an Oscar nomination but for the final weeks of the NFL Pro Football season. In recent years there’s been much discussion, more at the high-school and college level, about the long-term effects of football related head injuries and what steps are being taken to prevent these tough damages within a sport known for its necessary roughness. Director Peter Landesman (Kill the Messenger) created Concussion out of a GQ article that followed the studies of Dr. Bennet Omalu, a Nigerian immigrant working in the Pittsburgh coroner’s office. Dr. Omalu came to America like so many, looking for the American dream with his own set of ideals and values. When he delves deeper into the death of an ex-pro footballer, he identifies a slow-developing injury in the brain previously undetected. His colleagues (especially a bitter co-worker) think he’s marching down the wrong path but Dr. Omalu’s drive and conviction eventually attract national attention. Going up against an organization as big as the NFL is no small feat but with the help of a former NFL physician (Alec Baldwin, Aloha, more awake and alive than ever) and his superior (Albert Brooks, A Most Violent Year, excellently wry) he shines a light on a problem many are choosing to actively ignore. First dismissed then vilified, Dr. Omalu’s persistence in his findings aims to bring about a change…but at what personal cost? The film is on point in its message and overall is an entertaining two hours that goes by quickly. It’s only after that you realize the loose ends present, the characters introduced but not fleshed out or truly finalized. Years go by over the course of several scenes and it can be difficult to keep track of where we are in the grand scheme of things. The movie relies on Dr. Omalu’s growing relationship with a romantic interest (Gugu Mbatha-Raw, Jupiter Ascending) and the building of his dream house to help us chart the timeline. While this is Dr. Omalu’s story, Concussion doesn’t seem like it has a serious agenda at play. That could be purposeful, a way to not anger the football fans that are likely the target audience. But this isn’t just another sports picture, there are no nail-biting touchdown plays or Hail-Marys in the final seconds. It’s a true life account of one man seeing a problem and trying to fix it, no matter how unpopular his opinion may be. And it’s worth seeing.